The computer modules DP-HR CON are available in different expansions and differ based on the number of video channels, the transmission medium, the transparent USB transfer. DP-HR-U-COm Fibre components let you integrate graphics cards and monitors with DisplayPort™ connectors at high resolutions into digital matrix systems. A bandwidth up to 300 Mpixels/s allows resolutions up to 2560x1600 / 60Hz.. The basic console modules make it possible to configure your system to exactly fit your needs. They are divided by the transmitted video signal and are available in additional variants. Integrate high resolutions into the system. DP-HR components let you integrate graphics cards and monitors with DisplayPort™ connectors at high resolutions into digital matrix systems. A bandwidth up to 300 Mpixels/s allows resolutions up to 2560x1600 / 60Hz. 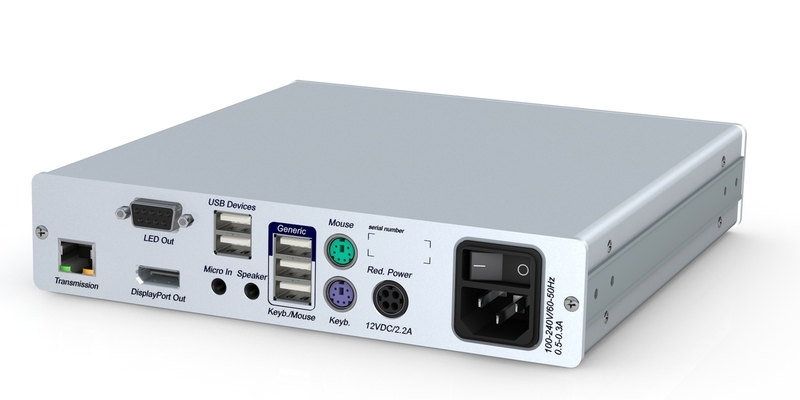 The transmission takes place via CAT cables or optical fibers (only for ControlCenter range) thus allowing transmission distances of up to 10,000 m.
The computer modules DP-HR CPU are available in different expansions and differ based on the number of video channels, the transmission medium, the transparent USB transfer and the possibility of controlling redundant matrix switch clusters.